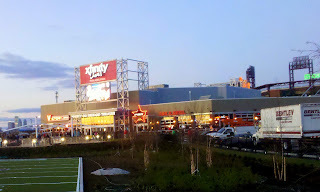 22nd & Philly: Xfinity Live! - More Than a Sports Bar? Xfinity Live! - More Than a Sports Bar? 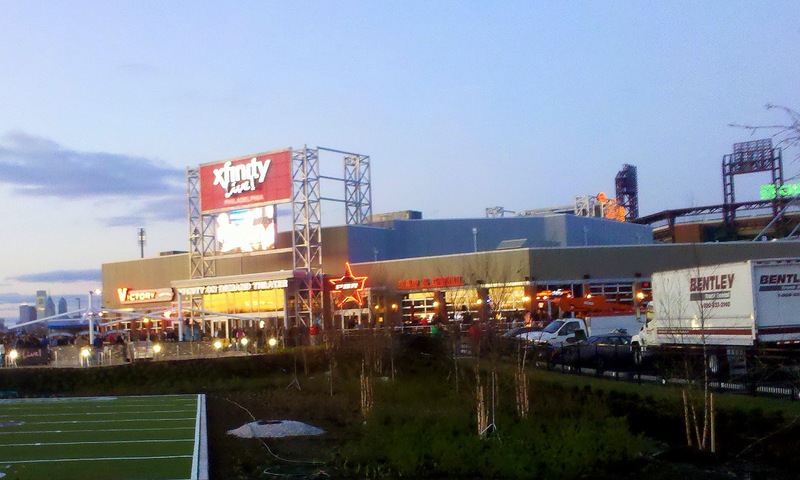 If you haven't heard about the opening of Xfinity Live! by now, you're likely still waking up from your winter hibernation. We'll let others go into greater detail about the food/drinks at Xfinity Live! (for reviews check out this The Daily News article) and instead provide an overview of what to expect from the vantage point of a Philly sports fan and frequent tailgater. 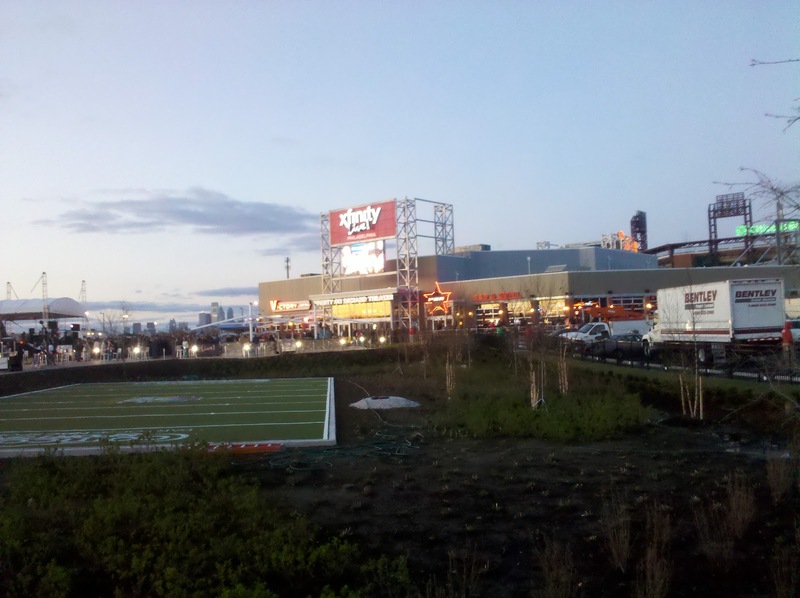 Three concepts sum up Xfinity Live! from this view - overdue, crowded and untapped potential. It’s about time Ed Snider and others attempted to add more juice to the Sports Complex area even if they had to tear down the best arena ever to make it happen. Ever since Citizens Bank Park was put in South Philly (instead of Center City), the Sports Complex has been mentioned as a possible destination beyond just game days, at least in my household. 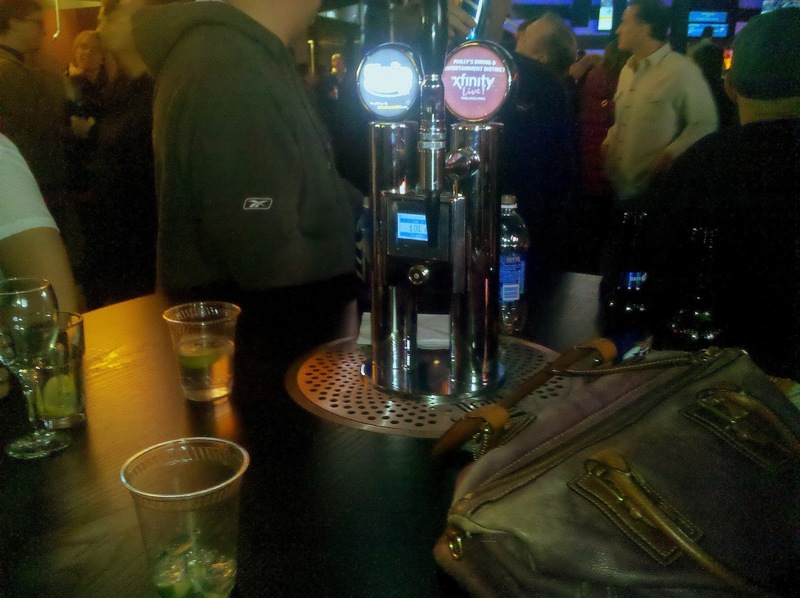 Sure, there is McFadden’s or even the bar inside the whatchamacallit-arena-currently-known-as-Wells Fargo Center. But none of these is a true destinations without a game. 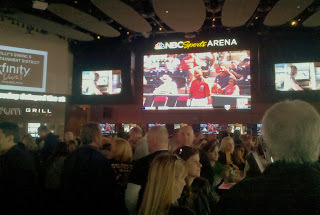 Xfinity Live! is a stab at changing that. Some of the right pieces are in place to draw a general bar crowd, although several severe drawbacks likely mean it's destined to be mostly an excellent place to watch sports. 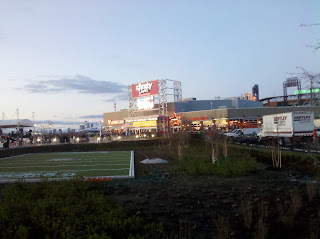 The main section consists of the NBC Sports Arena and Philly Marketplace. Flat screens are everywhere with a 32-foot HD screen as the centerpiece. The atmosphere is impressive with hometown announcers piped over the speakers, horns blaring when the Flyers score and an endless crowd of fellow fans. It's a high standard for any sports bar to match. Decent attempts were made to bring some pizzazz to the dining areas located outside the main viewing area with four bars/restaurants - Victory Pub, Spectrum Grill, Broad Street Bullies and PBR Pub. The "PBR" of PBR Pub stands for Professional Bull Rider not Pabst Blue Ribbon. Therefore the showcase of the bar is a mechanical bull. And you're in for some interesting entertainment if the few people we saw on the bull provided a glimpse of the future. Victory Pub was the only dining place we hung out at. It's set up like a beer hall and has a small stage for live music or other entertainment. The music was waaayyy to loud and made it difficult to hold a conversation. I can't say if this will be the norm after one visit though. Another drawback is that the bar is located at the front entrance, creating a massive traffic jam to navigate before reaching the main seating area. The food at Victory is stadium quality at best, but the wide range of Victory beers on tap is a win. It's a good place to choose for a drink or two before going to a game. Scoring one of the tables outside would be ideal on a nice night in the summer. You can also grab food at walk-up places including another Chickie’s and Pete’s, Philadelphia Cheesesteak Company and Nick's Roast Beef. The sandwich at Nick's was again the same you'd get inside the stadium. 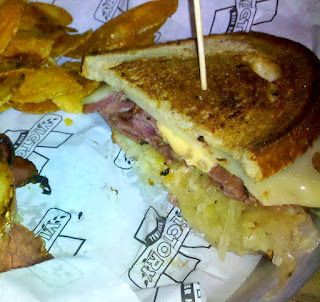 Conclusion on the food at Xfinity Live: unless you need a quick bite, skip these places and stick to grilling at a tailgate. It's not a place to go just for the food. The coolest innovation inside Xfinity Live is the self-serve beer tap seen below with a pay-as-you-pour option. We didn't partake, but it looked like you can just pay with a credit card. It is a genius idea and something I think we'll start to see at more places in the future. The biggest downside of Xfnity Live! is the lack of space. The two times I visited – before a Springsteen concert and a Saturday before a non-playoff Sixers game - getting through the main area was like whacking your way through a jungle with a butter knife. There will be less crowded times, but expect this to be the norm for important events. The aisles through the main section snake around several bars, creating a bottleneck of people waiting in line for beer while others just try to get by. There is plenty of room to stand with a drink at the mini-ledges along the booths of the seating areas, but this further shrinks the room available to navigate through the aisles. 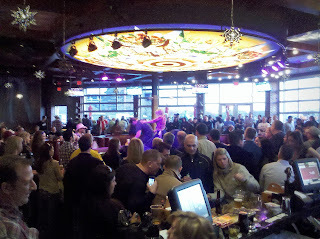 Reports state the current Xfinity Live! is only phase one. That's a good thing because my major concern is that it will fail to become a true destination for non-sports events as currently built. With just a bit more investment, it seems they could have created more space, added some unique entertainment or heck, added one of those stupid casinos. Otherwise, the designers did just about about the best they could within the available space, unless they had skipped some of the dining options. 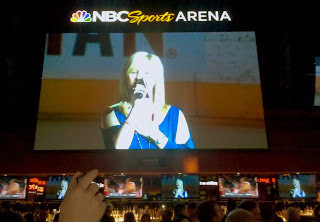 From a sports fan perceptive, Xfinity Live! is an upgrade for some pre- and post-game festivities. When time permits, I'm more likely to stick to tailgating before concerts or games, but if you don't have a ticket for a big game, the place is destined to become the top spot to watch because of the atmosphere. It's doubtful I'd make a trip there for anything non-sports related. Share your impressions of Xfinity Live! or your experiences in the comment section. Also, anyone know what the plans are for the mini football field outside?